Subtitle "50 of the biggest Drum & Bass Rollers"
Packaged in 3 slim jewelcases in a cardboard slipcase with 8-page booklet. 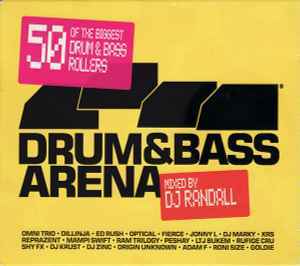 This compilation ℗ & © 2004 Warner Music UK Ltd.
Track 3.15 is credited to Rufige Cru. This album I was devastated with in the sense I was speechless because how the Roni Size and Reprazent tune "Share the Fall" was mixed in with "Bambaata" by Shy FX just kills it for me. This album is the bomb and DJ Randall delivers us some solid classics on here like "Piper" by Jonny L, "Acid Trak" by Dillinja, "The One" by Mampi Swift and the list is endless. A personal favourite of mine on here is "Sonar" by Trace... The mixing on this album is excellent in my opinion and has the best oldskool tunes probably on any drum & bass album. DJ Randall smashes it with 50 big d&b rollers, an excellent album in my honest opinion but Drum & Bass Arena never release rubbish albums or material and DJ Randall is the same. This album is a 10/10. This is the compilation that introduced me to drum & bass, jungle and yes even dance music. Its loaded with banging tracks which makes it a good guide to get the dnb taste. Also when I first only liked a few songs, I gradually began to find more and more good stuff on this sampler during my dnb time. Its a joy to come back to this mix everytime.